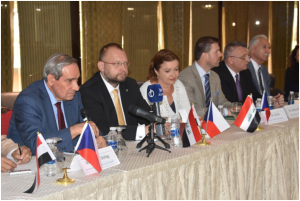 The Iraqi- Czech Economic Forum was held in Baghdad on Sunday, 30.07.17 according to the invitation forwarded by the Iraqi deputy speaker of Parliament, Dr. Humam Hamoodi and with the attendance of public and private sectors representatives of the two sides. The conference started with a welcome speech by Dr. Sami AL- Araji, Chairman of the National Investment Commission through which he conveyed Iraq real willingness to cooperate with the Czech republic in the various economic sectors, reviewing the history of economic relations between the two countries since the 50s of the last century. A speech by the Czech Parliament deputy speaker, Mr. Jan Bartošek followed, through which he considered sectors of security, education and health care stand at the top of the list of essential needs that must be met for each human being willing to live a decent life. 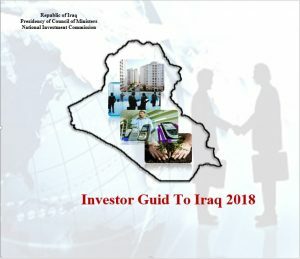 Ms. Miloše Horská, Vice-chairman of the Czech Senate, in her turn, congratulated Iraqi government and people for the victories achieved over ISIS gangs, expressing her pride in shutting this black page down in the history of Iraq, and hoping that the next stage shall witness quick economic jump to meet the critical need for the advancement of the Iraqi economy, adding that this meeting should not be considered meant only for commercial exchange but also as a pleasant opportunity to exchange culture and relations between the two countries. Mr. Bořivoj Minář, Deputy Czech Chambre of Commerce introduced a short brief of the Czech Chamber of commerce and Industry which consist of 15 thousand company and businessmen and represent a proportion of 60% of the total Czech Economic activity in all specializations. He presented a number of sectors through which cooperation is possible between the two countries like Agriculture, Health, Complementary Industries, Power Stations, food industries, Machines and Equipments…etc. The conference also was attended by a number of the Iraqi Public sector representatives from Ministries of Construction & Housing, Agriculture, Iraqi Central Bank, National insurance, while the Iraqi private sector was represented by the members of the unions and councils of businessmen. The Czech side presented through a detailed presentation the most prominent specializations of the attendant Czech companies and the opportunities to cooperate with them in different economic fields. 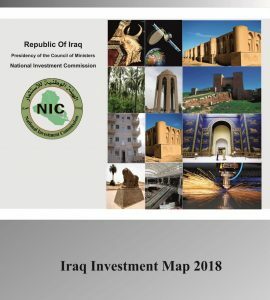 NIC Chairman introduced a n overview of the investment opportunities available in Iraq for the short run top listed by the projects of the reconstruction of the infrastructure of the damaged cities either by direct investments or through partnerships with the Iraqi public and private sectors. The second day of the visit shall include signing a cooperation protocol between the Iraqi union of the Chambers of commerce and the Czech Chamber of Commerce and Industry. The conference was also attended by the Iraqi Ambassador to Brag, Mr. Waleed Sheltagh.